As nations strive to put humans farther into space for longer periods of time, the real loser in this new space race could be the astronauts themselves. That’s because experiments conducted on the International Space Station involving cells that line the inner surfaces of blood vessels (endothelial cells) show that microgravity accelerates cardiovascular disease and the biological aging of these cells. These findings are presented in a new research report published in November 2013 issue of The FASEB Journal. In this report, Bradamante and colleagues examined endothelial cells in real microgravity aboard the International Space Station and conducted deep gene expression and protein analysis on the cells. They compared space-flown endothelial cells to endothelial cells cultured under normal gravity, looking for differences in gene expression and/or in the profile of secreted proteins. Space-flown cells differentially expressed more than 1,000 genes and secreted high amounts of pro-inflammatory cytokines. Ultimately, this induced significant oxidative stress, causing inflammation among endothelial cells, which in turn, led to atherosclerosis and cell senescence (biological aging). April 15, 2019 - Moon's surface spurts out 'water' during meteorite impacts Down To Earth MagazineLatest findings shed light on the history and origins of water on the lunar surface. November 14, 2013 - How Living in Space Accelerates the Aging Process Popular MechanicsA study published earlier this month explains how astronauts become stricken with age-related diseases when exposed to microgravity. February 1, 2019 - Alarming Research: Zero Gravity Makes Astronauts' Brains Age Faster FuturismA new study found that spaceflight was associated with changes in the brain's white matter, causing it to age faster. But consequences are still unknown. November 17, 2018 - How blasting worms into space could help slow down the ageing process Telegraph.co.ukA tiny transparent worm could be the key to finding out how to stop the frailty and ill health which often comes with old age. December 6, 2018 - Health experiments launch for space station | CU Boulder Today CU Boulder TodayFour experiments supported by BioServe Space Technologies blasted off en route to the International Space Station this week. February 5, 2018 - R&D in Space: Medical Discoveries in Microgravity R & D MagazinePart two in a special four-part series on space-based science highlights micro-gRx, a company that is studying the effects of microgravity on human muscle. December 3, 2018 - The First Crewed ISS Flight Since An Emergency Landing Happens Monday. Astronauts Say They're Confident in Russian Rocket - D-brief Discover MagazineThe Expedition 58 crew are the first to launch to the International Space Station on a Russian Soyuz rocket since an emergency abort mid-flight two months ago. December 16, 2018 - Understanding Aging and Muscle Loss in Space Astrobiology NewsIn space, the human body loses muscle mass. Although living in microgravity requires no heavy lifting, this loss of muscle reduces physical performance. February 26, 2019 - Human Food Might Be Making Bears Age Faster - D-brief Discover MagazineBlack bears are growing reliant on human food, which is altering their hibernation patterns and impacting their rates of cellular aging. September 12, 2018 - Worms In Space? ISS Experiment To Study Muscle Loss In Tiny Creatures International Business TimesA group of British researchers is planning to send hundreds of roundworms into space as part of an effort to better understand muscle loss during spaceflights. February 15, 2019 - NASA heading back to Moon soon, and this time to stay Phys.orgNASA is accelerating plans to return Americans to the Moon, and this time, the US space agency says it will be there to stay. March 12, 2019 - One Giant Leap: Space Radiation Research May Help Astronauts and Patients Alike MedscapeNASA is investing in studies on the mitigation of space radiation damage. In aiming for the stars, can they provide treatments for earthly health issues as well? January 28, 2019 - Does Spaceflight Impair Astronaut's Ability to Fight Cancer and Viruses? - D-brief Discover MagazineLong-duration space flight could harm astronauts' immune systems, adding a potentially dangerous health consequence for traveling to Mars. January 26, 2018 - Prototypes for the new space age MIT NewsThe Media Lab Space Exploration Initiative shares results and next steps from its first zero gravity research mission. April 7, 2016 - Protection against neurodegenerative disease on Earth and in space Nature.comAll living organisms have evolutionarily adapted themselves to the Earth's gravity, and failure to adapt to gravity changes may lead to pathological conditions. August 15, 2017 - NASA sends mice to space station to study space travel health risks UPI.comWith Monday's SpaceX launch a success, a group of mice are en route to the International Space Station. December 20, 2018 - Could Extraterrestrial Sugar Explain How Life Began on Earth? - D-brief Discover MagazineDerivatives of a component of DNA have been identified in carbon-rich meteorite samples for the first time ever. March 1, 2019 - SpaceX Ready to Launch First Dragon Crew Capsule Early Tomorrow - D-brief Discover MagazineSpaceX's Dragon Crew capsule gets its first test flight this weekend and docks at the International Space Station. Its sole passenger: a dummy named Ripley. January 22, 2019 - In a Series of Experiments, Scientists Are Learning How to Farm on Mars - D-brief Discover MagazineScientists are trying to perfect a technique for space farming so that astronauts have enough food to get to the Red Planet and back - or even farm on Mars. September 12, 2018 - Space age bottle of luxury Mumm Champagne is made for wealthy tourists in orbit Daily MailThe champagne is being testing during an Airbus A300 Zero-G flight from Reims, in the heart of France's Champagne country. April 7, 2016 - The health hazards of space travel As the opportunity for space travel comes closer and astronauts Medical News TodayAs the opportunity for space travel comes closer and astronauts start thinking about visits to Mars, we ask: what are the health risks of space travel? February 7, 2019 - NASA Honors Fallen Astronauts with Day of Remembrance - D-brief Discover MagazineEvery year, NASA recognizes astronauts who lost their lives in the pursuit of spaceflight with an official Day of Remembrance. This year, it's celebrated Feb. 7. January 8, 2019 - Even in Space, Microbes Continue to Evolve - D-brief Discover MagazineScientists studying microbes on the space station have found that they continue to evolve to survive the unusual conditions. March 8, 2019 - Crew Dragon Still Faces Crucial Tests Before NASA Certifies it Safe for Astronauts - D-brief Discover MagazineSpaceX's first Crew Dragon flight was a success, but Elon Musk's company still has a lot of testing before NASA certifies the spacecraft is safe for humans. April 12, 2018 - A brief look at the history (and future) of humans in space CosmosOn 12 April 1961, Yuri Gagarin became the first human to cross into outer space. Today, the International Space Station is a permanent outpost in the heavens. January 28, 2019 - Hubble's Most-Used Camera is Back in Action After a Strange Malfunction - D-brief Discover MagazineHubble's most-used camera stopped functioning earlier this month, but is operational once again. October 22, 2018 - Gravitational waves could soon provide measure of universe's expansion Phys.orgTwenty years ago, scientists were shocked to realize that our universe is not only expanding, but that it's expanding fasterover time. February 25, 2015 - Image: Human endothelial cells experiment bound for ISS Phys.OrgComponents of human endothelial cells stained for identification. 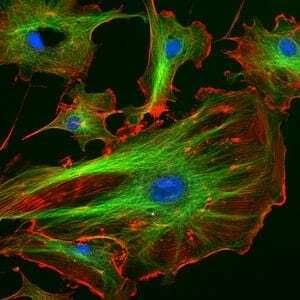 In red is the 'actin' protein that allows the cells to move, adhere, divide and react to stimuli. November 26, 2018 - NASA's Mars Lander Is Preparing to Peer Beneath the Planet's Surface - D-brief Discover MagazineNASA's InSight lander touched down successfully on Mars' surface. Now, it will prepare to look beneath it. January 31, 2019 - New Study Says that Dark Energy Could be Growing in Strength - D-brief Discover MagazineOne new study shows how dark energy may be changing over time. October 31, 2018 - Bose-Einstein condensate generated in space for the first time: Physicists put in place groundwork for accurately testing Einstein's equivalence principle Science DailyScientists have created a Bose-Einstein condensate for the first time in space on board a research rocket. March 13, 2019 - Scientists Used IBM's Quantum Computer to Reverse Time, Possibly Breaking a Law of Physics - D-brief Discover MagazineScientists returned a quantum computer to a previous state, effectively reversing time and maybe breaking a fundamental law of physics. October 18, 2011 - Gravitational biology and space life sciences and implications for the Indian space program Space DailyChennai, India (SPX) Oct 18, 2011 - This paper is an introduction to gravitational and space life sciences and a summary of key achievements in the field. December 19, 2018 - Astronauts Set To Return to Earth in Spacecraft They Just Cut a Hole In - D-brief Discover MagazineThe ISS crew will fly back in a Soyuz spacecraft with a hole cut into it on a recent spacewalk. Experts say there's little reason for concern. March 5, 2019 - Uncovering Earth's Orbital History Buried in Ancient Rock Deposits - D-brief Discover MagazineScientists are using core samples to backtrack Earth's climate and orbital motions across hundreds of millions of years. February 13, 2019 - The Greatest Discoveries From NASA's Mars Opportunity Rover - D-brief Discover MagazineNASA's Opportunity Rover spent fourteen years exploring Mars and performing science. Here are some of the highlights. January 18, 2019 - The Remains of Ancient Lunar Impacts Reveal Earth's Own Impact History - D-brief Discover MagazineBy studying the craters left from lunar impacts, researchers have revealed new information about impacts on Earth. December 6, 2018 - China Prepares to Head for the Far Side of the Moon - D-brief Discover MagazineChina's Chang'e-4 mission to the moon's far side is set to launch Friday. April 3, 2017 - It sounds crazy, but NASA is seriously growing space crystals to help make better drugs Digital TrendsCrystals grow differently in space than they do on Earth, and astronauts on board the ISS have been tasked with finding out why. June 4, 2018 - Einstein's 'Imaginary Elevator' Thought Experiment Proven Right Again - D-brief Discover MagazineWell, Einstein's done it again! That is to say, the gravitational theories of Albert Einstein have once again been confirmed, and to a new degree of precision. January 8, 2019 - Scientists Say They're Close to Making A Spicy Tomato - D-brief Discover MagazineTomatoes still possess the genes to make capsaicin, all researchers need to do is turn them on. December 14, 2018 - NASA's GEDI Mission Will Track Carbon Emissions in Earth's Forests - D-brief Discover MagazineThe mission will use laser light to create 3D maps of Earth's forests, shedding light on carbon cycling, natural habitats and deforestation.